Dr. Ernest E. Cutler, Jr. 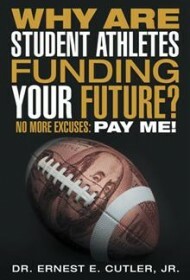 This scholarly research study brings some dispassionate cool to a red-hot social issue: the plight of student-athletes the National Collegiate Athletic Association has long treated like chattel in the name of “amateurism.” Former Navy man Ernest E. Cutler, Jr.’s book comprises his stiff, academically rigorous PhD. dissertation at Northcentral University (Prescott, Az. ), offering a timely call for economic justice. The Texas author writes that his work “is not intended to disrespect the NCAA” (back cover), but he joins a growing chorus of voices who find a Big Lie in the NCAA’s self-serving definition of the word “amateur.” Because college players are often immature, scandals, alumni infractions, and compliance violations involving under-the-table payments and favors to student-athletes “will still occur,” if athletes are monetarily compensated, he writes. But “financial security for all student-athletes” would help alleviate those problems while recognizing the commercial realities of big-time college sports. Cutler’s research involved in-person interviews at the University of Texas (San Antonio) and an elaborate array of questionnaires completed at 120 other colleges. Participants included athletic administrators and current and former student-athletes. Using carefully considered data from this research, the author concludes that college athletes should be entitled to “small gifts,” sports apparel endorsement contracts and reasonable financial stipends to cover the onerous shortfalls of their athletic scholarships. The author offers an extensive list of references in an appendix. Unfortunately, some events remain beyond the scope of Cutler’s study. Two examples: The recent attempt of Northwestern University football players to form a union; and the pivotal Ed O’Bannon vs. NCAA case that dealt a blow to the NCAA’s long ban on compensating college athletes. These would have been welcome additions to the narrative, albeit outside the realm of Cutler’s dissertation. This is an academic piece of writing and, as such, is not easy reading. But it offers a compelling argument, worthy of the consideration of college administrators and any reader interested in sports and its interplay with society.